Good Morning & Happy Tuesday Friends!!! My post for today will be short & sweet. We're supposed to get a LOT of snow & I have to take my oldest son to the dentist to fix his broken tooth. He was getting out of the pool at school, slipped & hit his mouth breaking his front tooth!! I'm keeping my fingers crossed & saying prayers as I drive in this mess today because I'd much rather stay at home but this does need to be taken care of ASAP! Sooooo, onto my post.....my creation for today is totally inspired by the awesome sketch over at the Mojo Monday Challenge Blog. I have always LOVED the sketches they come up with for the simple reason that they inspire such creativity in me. I immediately knew that I wanted to make a square card and use my Greeting Card Kids stampset. I figured I could brush up on my coloring skills with these adorable stamps & I must say that I truly enjoyed putting this beauty together. The layout gave me the opportunity to use up some of my leftover DSP & that gorgeous Glimmer Paper....it's so easy to punch with it---there's no mess!!!! Once I had it all laid out, I decided my card needed some texture at the bottom and ribbon at the top to finish it off......I am extremely happy with it & I hope you all enjoy it as well!!! Thanks so much for poppin' in today and have a great rest of the day!!! Beautiful card, love this stamp and you colored her so well. The hearts down the page card are beautiful. Jackie, this is adorable! I love that little girl image and you did a beautiful job coloring her!! LOVE that paper and your layout is fabulous!!!! Great job! I love the hearts that edge the DSP and the white! so creative to make the transition so fun! Your card is adorable!!! This is so cute! I love the papers and cute image you used. 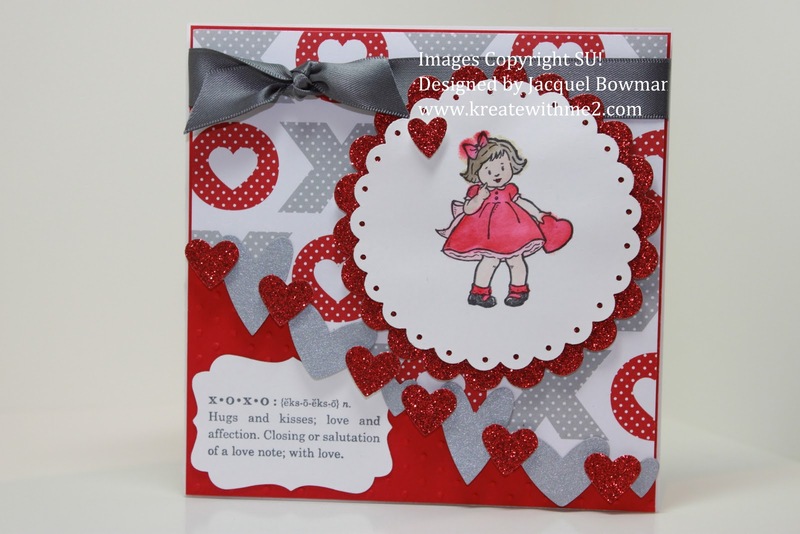 Adorable, love the layout and the colors are perfect for Valentine's Day! I just love this 'old fashioned' stamp set! Your card is adorable, very cute indeed. I hope your son's tooth was savable. Isee from your post today that you did get there and back safely. Stay warm and enjoy another snowed in day! This valentine is precious, too! Isn't she as cute as a button? Such a pretty card. The cascading lovehearts are adorable too. Great job! What a darling little valentine Jackie!